Brace yourself for some shocking news. For the first time in a century—maybe in our nation’s history—Americans eat more chicken than beef. According to the USDA and reported by National Public Radio, in 2012 (the most recent year for which we have data), we consumed a per capita 57.5 pounds of beef. For you history buffs out there, that’s about the same consumption level we had in 1909. Beef-eating peaked in America in the 1970s, when we managed to put away 80 pounds per person. (That still pales next to Argentina, where people devour more than 130 pounds of beef per person each year.) Meanwhile, the popularity of chicken has grown steadily: it now stands at 60 pounds per person per year, surpassing beef as the most popular animal protein in the U.S.
What has caused this tectonic shift in America’s food landscape? The price of wholesale beef hit an all-time high in 2013. For the consumer, this meant the price of choice beef near the end of the year was averaging about $5.41 per pound compared to $1.96 for broiler chickens (“two buck cluck?”). Poultry, especially white meat, is perceived as being healthier than red meat. Sales of animal proteins in general are being impacted by a new generation of vegetarians, vegans, and “flexitarians”—people who mostly follow a vegetarian-inclined diet but occasionally eat meat. While never one to turn my back on the sanguine glory of a well-grilled steak, I like chicken. A lot. At least twice a month (often more), a whole chicken turns up on the Raichlen rotisserie. (I use a charcoal-burning rotisserie, so I can toss wood chips on the coals.) Even the boneless skinless chicken breast—maligned by most food writers—turns up on my grill, one week glazed with homemade teriyaki sauce, one week slathered with tandoori spices, one week grilled Tuscan style—spatchcocked (butterflied) under a brick. 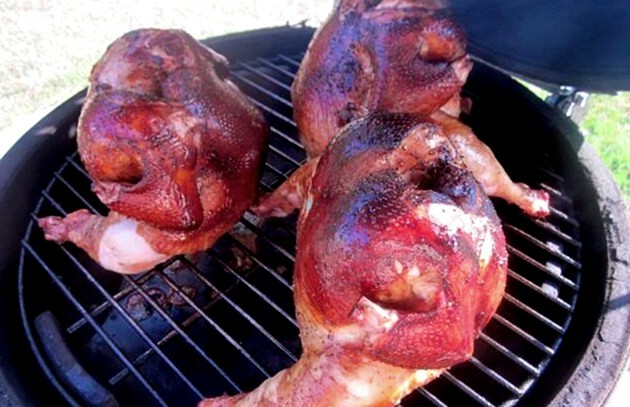 Chicken (affectionately dubbed “yardbird” by pit masters) makes a perfect meat for the grill or smoker. It cooks relatively quickly. Its mild meat absorbs flavor like a sponge, making it endlessly versatile. It’s conveniently jointed, meaning a whole bird is easy to break down before or after cooking. It’s also eminently affordable—no wonder past presidents and kings promised their nations a chicken in every pot. Of course you’ve grilled chicken. So how can you help your poultry grilling, er, take flight? Brine and dine: A soak in a saline solution is the perfect antidote to dried out chicken white meat. Your brined chicken breast or whole bird will emerge from the grill or smoker juicier and more flavorful. The basic brine formula calls for 1/2 cup of kosher salt and 2 quarts of water. For a touch of sweetness add 1/4 cup of sugar or honey. Kick up the flavor by adding aromatics—peppercorns, bay leaf, citrus rind, dried or fresh herbs, garlic, etc. Remember to whisk your brine until the salt and sugar crystals dissolve completely. Submerge the urge: When brining chicken, place resealable plastic bags of ice on top to keep the meat chilled and covered with brine. Brine chicken pieces in the refrigerator for 1 to 2 hours; whole birds for 8 to 12 hours. Drain and dry on paper towels before smoking or grilling. Crispy critters: For supernaturally crisp skin, allow the chicken to air-dry, uncovered, on a wire rack over a rimmed baking sheet in the refrigerator for up to 8 hours. (If you’ve brined the chicken, make this your second step.) Brush the skin with olive oil or melted butter and grill the bird at a medium to medium-high heat—350 to 400 degrees—so the fat can properly render. Up in smoke: Smoke the chicken on a charcoal grill using the indirect grilling method. Chicken smoked “low and slow” (in a smoker at 250 degrees) from start to finish will always have rubbery skin. But if you smoke it for the first 45 minutes, then finish at the aforementioned higher temperature, you’ll get the best of both worlds: smoky flavor and crisp, golden-brown skin. Get under its skin: Another way to add flavor and moistness is to chicken is to tuck flavored butters under the skin. On a whole chicken, use your fingers or the handle of a wooden spoon to gently loosen the skin covering the breast and thighs. Slip the room-temperature butter under the skin and gently massage to distribute. For a nice finishing touch, you can also rub the outside of the skin with the butter before serving. The butter adds gloss and flavor. You can use the same technique on skin-on breasts or thighs. Grill half chickens: Slash cooking times (and increase the surface area exposed to the smoke and fire) by halving chickens through the backbone before cooking (sometimes, you can buy them this way). Grill, bone-side down, until the skin is golden brown and the thickest part of the meat is 165 to 170 degrees when read on an instant-read meat thermometer. Pop open a cold one: Beer canning is one of the best ways there is to roast chicken. Enthrone it on a partially-filled beer or soda can, then pull the legs forward and position on a grill grate. (The can and the chickens’ legs will form a tripod, enabling it to stand upright.) Oil the outside of the bird, season with your favorite rub, and roast for 1 to 1-1/2 hours, or until the internal temperature reaches 165 to 170 degrees. The liquid in the can keeps the bird moist.